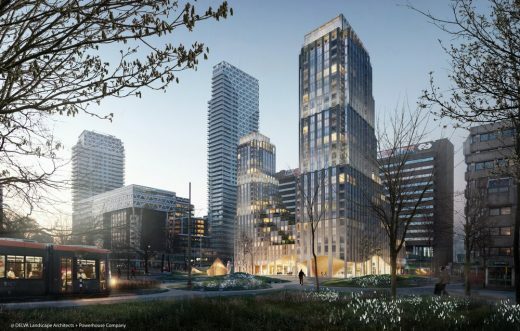 The evaluation committee has appointed Team DELVA / Powerhouse as the winning design proposal for a new building and public space on Queen Juliana Square (KJ Plein) in The Hague. 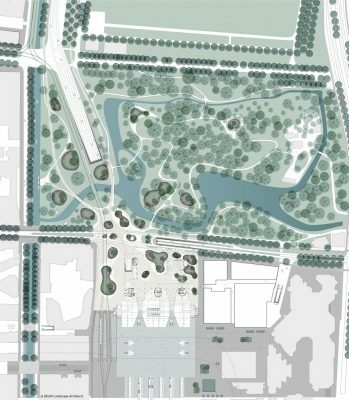 The proposal will serve as city’s gateway, standing in connection with the central train station. 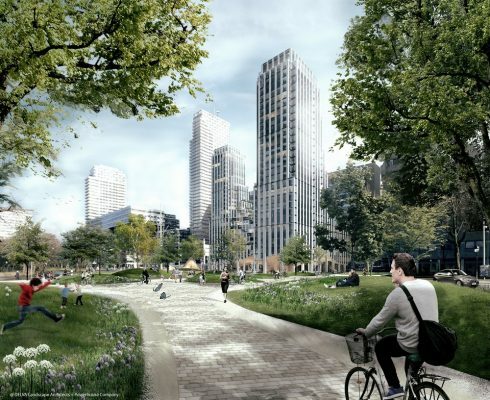 It’s symbolic value as the entrance to The Hague drives our ambition for a square that welcomes new visitors, provides an enticing social space for locals and in facilitating the rush of daily commuters. 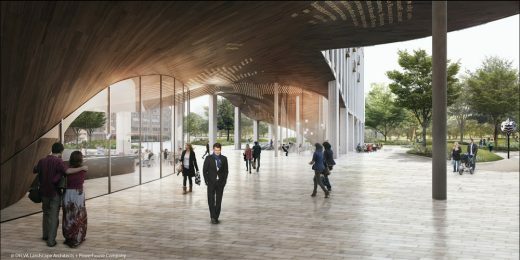 Through an efficient configuration of pedestrian, bicycle and vehicle circulation the square will function as a guiding entrance towards the center for incoming visitors as well as local commuters. In addition, a new bicycle parking basement located under the square will increase parking capacity whilst freeing up the square as a social gathering space. The Hague is a seaside city that effortlessly blends an official status as a judicial world capital with a pleasant, elegant and green look. Our plan for KJ square emphasises and reinforces these characteristics through an inclusive approach of landscape design, urbanism, architecture, engineering and programme implemention. 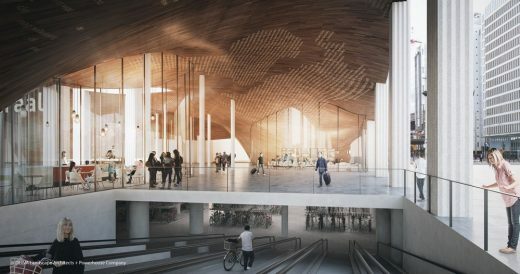 The new entrance hall will feature impressive artistic references to the international role of the city. It will offer new attractive bars and retail shops as well as conference and debate spaces. 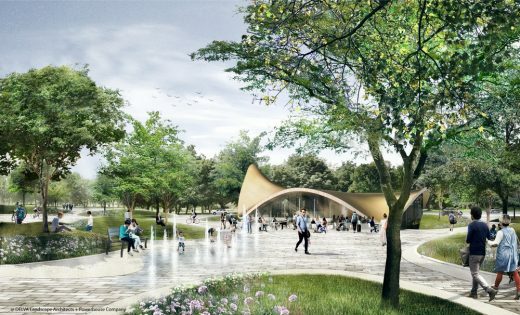 All this combined with a square where one can relax on the terraces of a new pavilion or take a leisurely stroll towards the Koekamp park, unhindered by traffic. 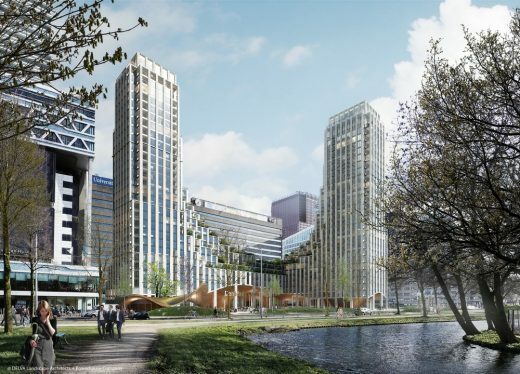 The Hague’s central train station will finally get the allure which it has been waiting for, for years. Leaving the new entrance hall hall one would gaze beyond the undulating arches towards the green of Koekamp park. The open entrance hall then transcends seamlessly into the square with the absence of doors or gates but with views of greenery and liveliness. The square serves as place of orientation but also a space for lounging. 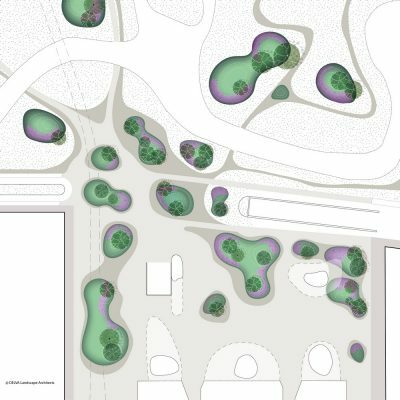 The design does not limit itself to KJ square but continues as a connection into the Koekamp park. Here you can enjoy the contrast between the busy station and inner city and the more leisurely, quiet and lush greenery. The KJ square is connected to a number of other formal squares within The Hague’s historical city center creating a link coined ‘The Hague carpet’. Each square along The Hague carpet has a specific identity in relation to their context or use of which our proposal will play a part. Many exisitng squares are bordered by museums, government institutions and other public buildings. Simultaneously, our plan aims to add a new link along ‘the green carpet’- a series of green spaces and parks. 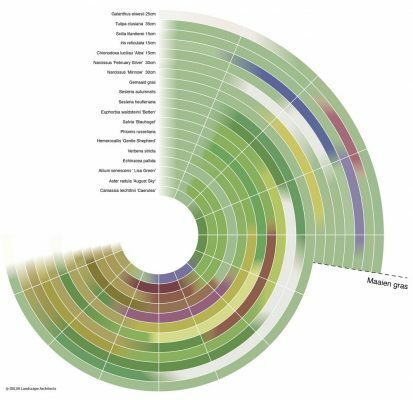 Fundamental characteristics from existing green spaces inform the ingredients for our proposal however, we add distinct 21st Century twist when it comes to durability, functionality, flexibility and quality of stay. KJ-square is the starting point of ‘the green carpet’ projecting a line that extends towards the historic center, the Museum Quarter, the Hague forest and beach. By thoughtful configuration of the building volume in response to sun path we are able to create a unique and site specific architectural form whilst encouraging maximum sunlight in the square. Traffic that flows through the square from central station follow the exciting, open façade line towards Koekamp park, the city center or the ‘Kiss & Ride’ zones. Traffic flows are managed in a subtle and casual way through manipulation of leisurely undulating green hills. Green hills form the spatial interaction between KJ square and the adjacent Koekamp park, as Koekamp’s greenery beelds across the road and into the square. Undulating hills in resemblance to The Hague’s historic dune landscape provide a social, leisurely space that mitigates the need for tree planters and that exhibits a variety of different shrub and tree species than found in Koekamp park. The square is a space that brings together a programme of movement and stay. The more shady side of the square is programmed for movement and circulation, where as a more green park condition is offered in the sunny areas. By imposing an inseparable relationship between square and park we create an enticing yet functional space. The spatial qualities of the square emphasise the scale and prominence of the entrance hall and new KJ building. The pavilion with it’s water play area form the heart of the square. 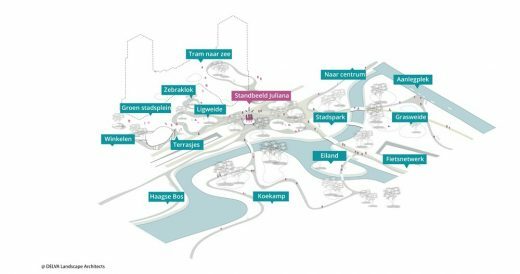 Upon exiting the station one will have the following options: Turfmarkt to the west, the city’s ministries to the North West or the park entrance to the North. From here one can walk to the historical city center and museum quarters. 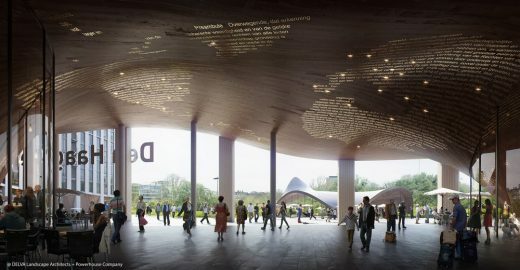 The captivating undulating ceiling of the new building features inscriptions of peace and justice that unfold over new cafés, restaurants and retail spaces. Beyond, a pavilion is nestled among green hills of grass and flowers. The trees of Koekamp provide and dynamic backdrop to children playing in the water elements, under the supervisional eye of parents from benches at the pavilion. Others are sunbathing on grass hills, life is beautiful, welcome to The Hague. The entrance hall was created by extruding points at ground level to create a beautiful high space and thus a clearly defined gateway to the city. Under the undulating roof of the hall several glass pavilions are designed to accommodate retail and food and beverage shops. The extended short side of the building is able to activate both the KJ square but also the lengthened Rijnstraat on the opposing side. Whilst the train station offers more established commercial brands, the new entrance hall focuses on new, mostly local concepts where quality and health are important priorities. The square is the park gateway to the city. We therefore propose to pave the square with a mottled carped of brown tinted granite tiles. These are comfortable to walk and cycle on, sustainable for maintenance and a reference to the sands and beach ridges of The Hague. This runs from beneath the entrance hall to the Koekamp park. The square of granite is bordered by water- permeable asphalt with a brown top layer; a material inspired by traditional Dutch town squares that contributes to an atmosphere of a city park. Trees on the green hills are distinguished from those in Koekamp in elevation but also in terms of species. Clusters of trees are scattered from the entrance hall through the square and deep into the park. The strength of the green hills is enhanced by tree rooting but also the introduction of flowering bulbs. The flowers will create a beautiful, colourful moments that extend from the square into Koekamp, blooming in spring dying off no later than April. Along the edges of the hills a variety of ornamental grasses and perennials appear adding to a dynamic and exciting array of colours. For the design of the KJ square we opted for an integral and sustainable approach based on principles of a circular economy- where waste flows are mitigated through re-using and recycling value. This allows the building to perform well in terms of energy consumption but also in terms of water and waste management. We have carefully designed the building and its surrounding landscape with an integrated approach, with a goal of creating a pleasant and sustainable environment for all.